Crows are smart, but they have a weakness for shiny objects. You have a shiny object, but so do your friends. There are too many shiny objects demanding the crows’ attention! Crows is the debut title for new designer Tyler Sigman and it will be officially released at the Spiel in Essen 2010. Players take turns placing tiles and then positioning their shiny objects to attract the most crows. Crows flock to the shiny objects based on simple rules. It’s going to take some wits to attract the most crows! When the deck of tiles has been exhausted, the player who has the scored the most points wins. 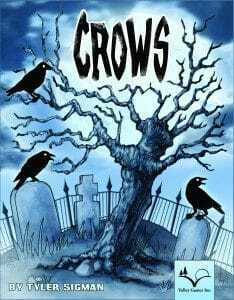 Crows is a game for 2 to 4 players aged 10 and up and takes approximately 45 minutes to play. The game has been translated from English to French, German, Italian, Dutch, and Spanish. Crows is number 7 in the Modern Line.